Three great launches today, a fairly strong wind - I'd say 10mph or higher. On the first flight, I put a stratologger (for use as just an altimeter) in the rocket, as I could not find my Jolly Logic. 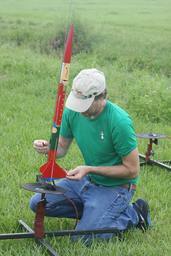 For an Estes style rocket, this was way to much weight with a 9V battery. If I had more time, I would have rigged up something with a button battery. It went around 690 feet up due to weight and wind - PF says higher - 721 feet, but it's just static from ejection charge - if you look at the data. 165mph. I had estimated 800 feet. For subsequent flights, I borrowed Freddy's Jolly Logic II - Thanks Freddy! I'm looking forward to seeing how high this goes without wind!